I’m what you might call a bread enthusiast. Not as bonkers as Steven Kaplan, the bread professor who showed Conan O’Brien how bread-making could be a “sexual act,” but a serious enthusiast nonetheless. I have Kaplan’s book, along with Nancy Silverton’s tome, on my nightstand. 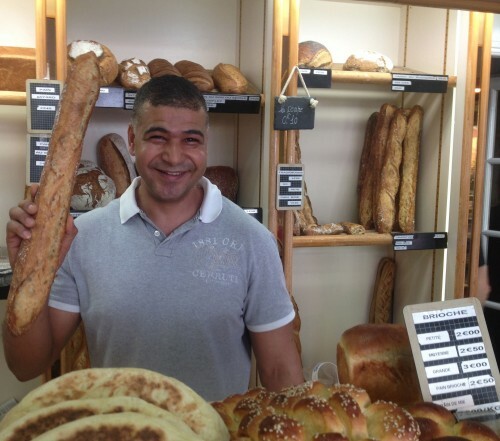 I teach tourists how to tell good baguette from bad. And I’ve been following the annual competition to name Paris’ Best Baguette with great interest for many years. Imagine, then, how excited I was to receive an email from the Mayor’s office, inviting me to be a jury member for the 2013 competition. 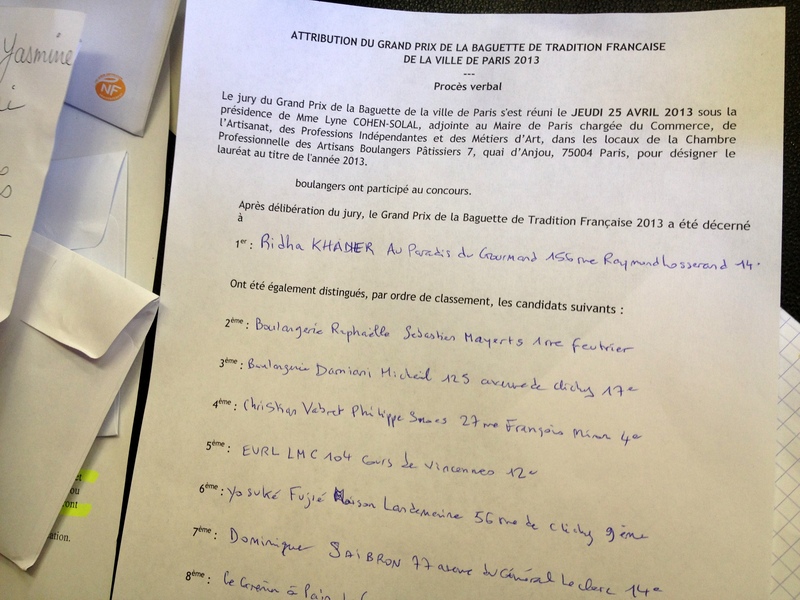 I confirmed my presence faster than you can say Grand prix de la baguette de tradition française de la Ville de Paris. 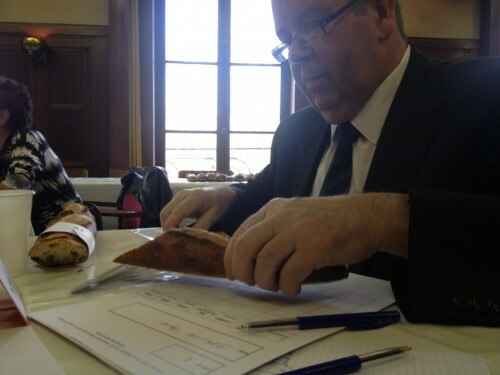 I took the mission seriously and prepared myself (by eating a lot of bread) to help select France’s next champion baker. Here’s how it went down. On the morning of April 25, 204 participating bakers dropped off two baguettes each at 7 quai d’Anjou on the Ile-Saint-Louis. 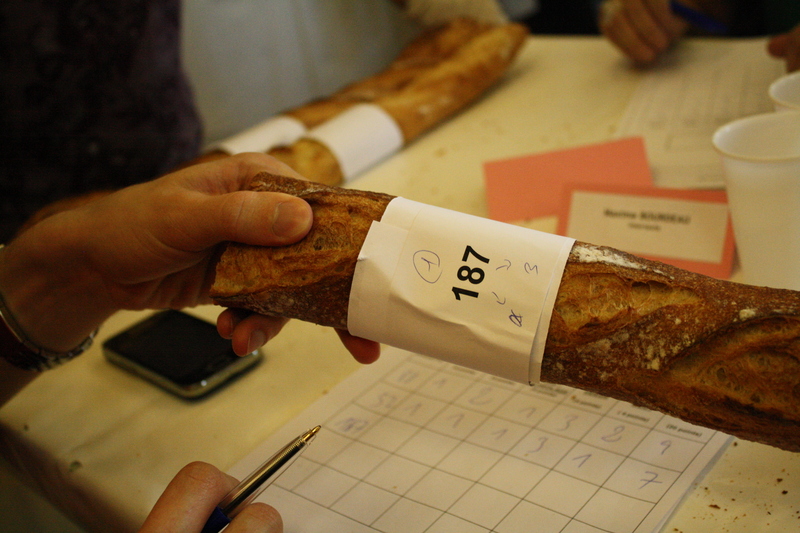 Only 152 bakers were accepted into competition. The rest were thrown out because they didn’t meet the strict size guidelines for a traditional French baguette (between 55-65cm and 250-300g). So what were we looking for? A good crumb should be elastic, with plenty of irregular sized and unevenly spaced holes, like the example on the right. The crust should be crunchy, not a wimpy millimeter like the example on the left. The degree of cooking is more subject to personal taste. Parisians often indicate their preferred cuisson when ordering – pas trop cuit for a blonde and doughy baguette, or bien cuit for something well-cooked. I know bakers who privately seethe when their customers order under-cooked baguettes because the cereal notes haven’t yet had a chance to develop. But as you can see form the range of colors below, there’s no gold standard for coloration. As soon as the final results were tallied, the President of the jury tore open an envelope marked with the winning number 187. Inside, a small hand-written paper contained the following information: Ridha Khadher, Au Paradis du Gourmand – 156 Rue Raymond Losserand, 75014. She immediately placed a phone call to Mr. Khadher to share the good news. He responded by repeating “vraiment? vraiment! ?” while the jury members applauded in the background. Our Assistant Editor Catherine Down raced over there as soon as I shared the address and found him fighting back tears, watching the line of customers grow down the sidewalk, telling her that he’d been baking since the age of fourteen but never imagined that something like this could happen to him. 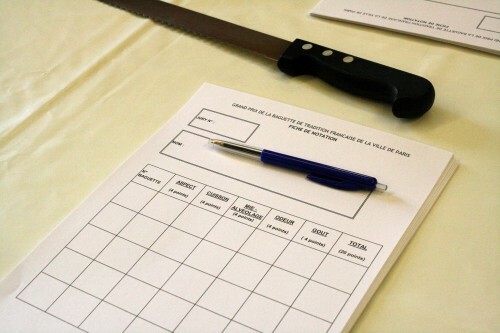 Khadher will receive a cash prize and trophy, along with the contract to supply the Élysée Presidential Palace with their bread for the coming year. The resulting media coverage will guarantee a line of customers down the block for the foreseeable future. As I write this, the other winners after Khadher haven’t yet been formerly announced. But I was able to snag a photo of the results, decipher the handwriting, and create this top ten list of the best baguettes for 2013. The #1 spot, which has been occupied by bakers from Montmartre for the past six years, no longer belongs to the 75018. 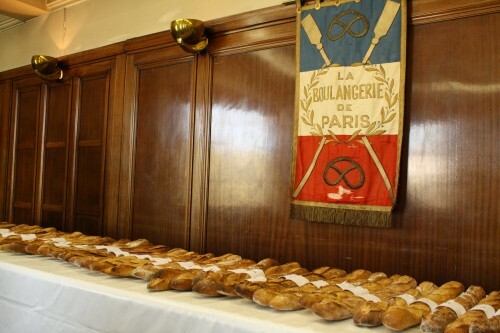 However, a bakery near Chateau Rouge came in second this year, and there are two more top ten bakeries clustered between Place du Clichy and Blanche. A pretty strong showing for the Butte, even if the winning bakery is on the opposite side of town. All in all, I’m thrilled to have dedicated three hours and three thousand calories to today’s tasting. The chance to talk about technique with Pascal Barillon was more than I could have hoped for, and the peek behind the scenes at this venerable competition was a dream come true. Thanks to the City of Paris for inviting me, and for continuing to support and celebrate artisanal bread-making with this annual event. I lived in Paris for 20 years and now have a house in Saumur. Paris doesn’t hold a candle to the baguettes of Saumur. The best I ever tasted is Alain Boree now boulanger in Nantes. I want to learn how to make baguette in order to have a small shop in US. Are you have any recommendation where to learn in Paris? given to every detail. Bravo. Thank you for the behind the scenes photos! Just curious…is the competition only opened for French citizens? I assume it is in order to preserve the tradition…..? Hi Lawrence, Poilane doesn’t make a baguette. They specialize in those thick crusty loaves called miche that you can keep for a few days, rather than the baguette which has a much shorter life span. Plus, there are very few big name bakers who continue to enter the competition, with the exception of Dominique Saibron, who regularly finishes in the top ten. I guess they are already well known, and there’s too much for them to lose, so they leave it to the younger or less recognized bakers. Thanks for this behind-the-scenes look, I’ve always wondered how prestigious competitions like this go down. The look of pure happiness on Mr. Khadher’s face is so special. 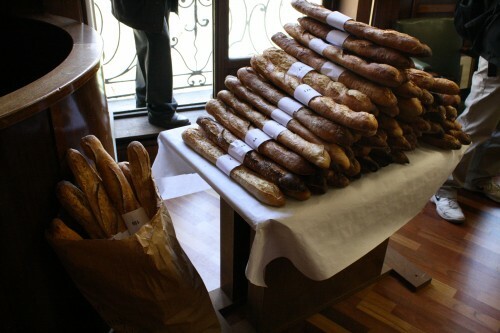 All that bread tasting must make for one helluva baguette hangover the next day. Is the best baguette based on a ‘tradition’ as the texture, holes, crust etc seem more along the lines of this than a standard baguette ? Thanks for the review. I think also that all the bakery don’t run for that prize. Must be very interesting to learn tips from PascalBarillon. Good question, Sharon. 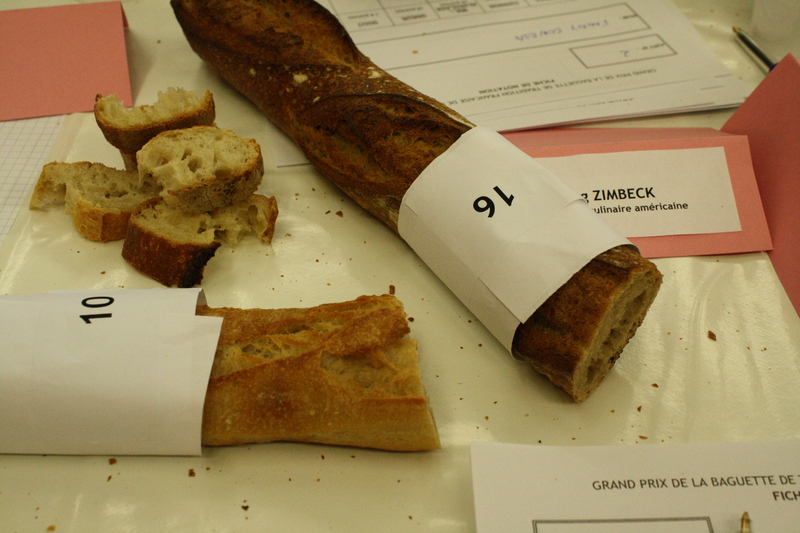 For one thing, the top three winners in one year are asked to be jury members the following year and so are therefore excluded from competition (although the 2012 winner was not present because he was judging Tokyo’s best baguette de tradition competition, which seems to be a new spin-off). Beyond that, though, you’d expect to see more of the top ten names repeating year after year. A few of these do repeat (Saibron, Delmontel, various franchises of Grenier à Pain), otherwise there’s a lot of variation from one year to the next. How to explain? For starters, I think that the daily production of most bakers varies a lot. Even master bakers turn out loaves that are perfect one day, a bit off the next, depending on humidity and a host of other factors. 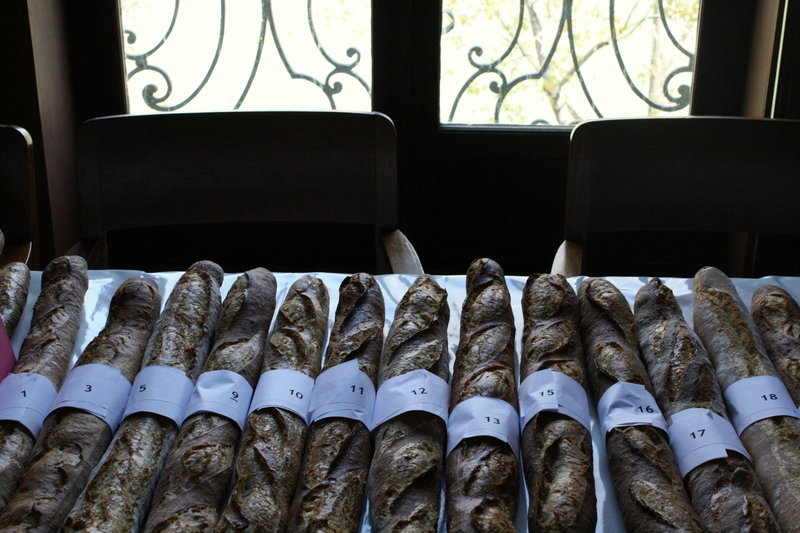 It’s a very long process, too, and bakers can’t correct or repeat in the hours before the competition if their baguette didn’t turn out the way they had hoped. And because it goes soft/stale within 5-7 hours, they can’t make a perfect one and then wait for the competition. On top of that, there was a huge variation in scores even at the table where I was sitting. I tended to be somewhat in line with baker Pascal Barillon to my left, although my scores were always a point higher (we positive Americans always grade more kindly), but otherwise there was little harmony among the group. Some people like diagonal slashes, or a more deeply colored baguette, or a denser crumb, or what have you. 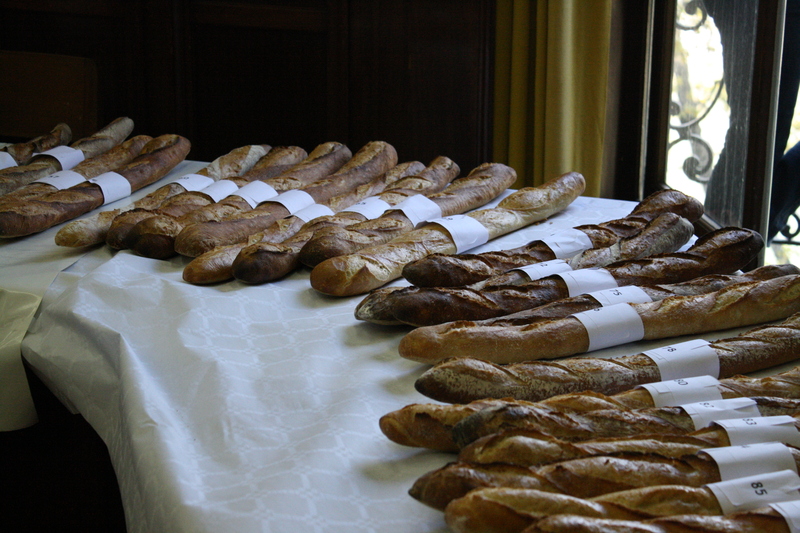 And there was certainly a little fatigue that set in toward the end of the first round of fifty baguettes. I probably graded some of the later loaves more harshly because it was harder for them to stand out in terms of taste. That’s why, despite the media buzz around the sole winner, I think it’s more interesting to report the Top Ten winning baguettes, because the margin in terms of quality between #1 and #4 in any given year is razor thin. So awesome that you were able to be a part of this! And that photo of the winner is priceless. I can’t wait to try his baguette! 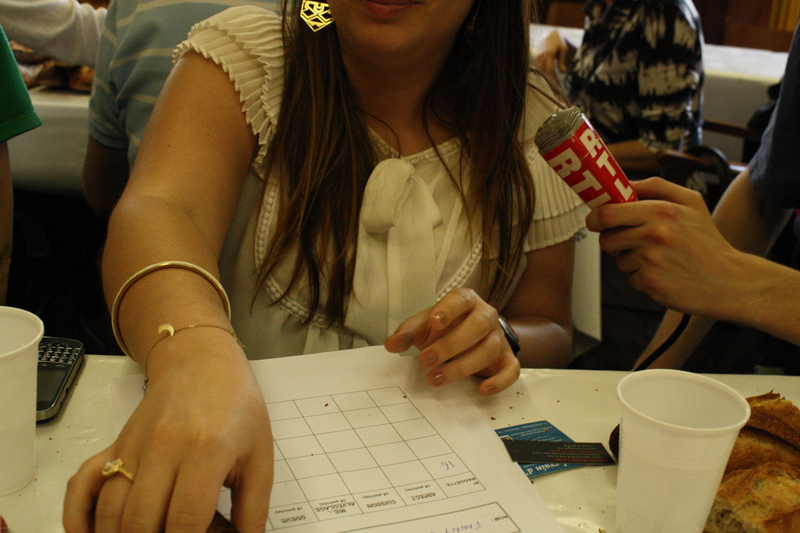 I loved reading your detailed account of what went down today in deciding the best boulangerie. It’s going to be a bit of a commute to the 14th from the 19th, but it’s going to be worth it. So pea green!!!!!! So fun to read your first hand accout.. 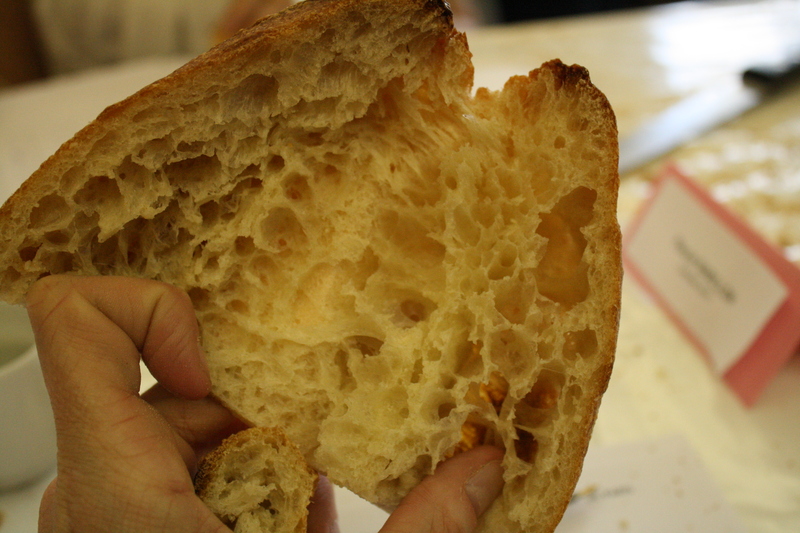 I felt like I was there… Listening to the crunch of the loaf…I could almost smell the yeast!!! Thank you…once again you are my Paris eyes ears and mouth! Any idea why the results are so wildly different from one year to the next? 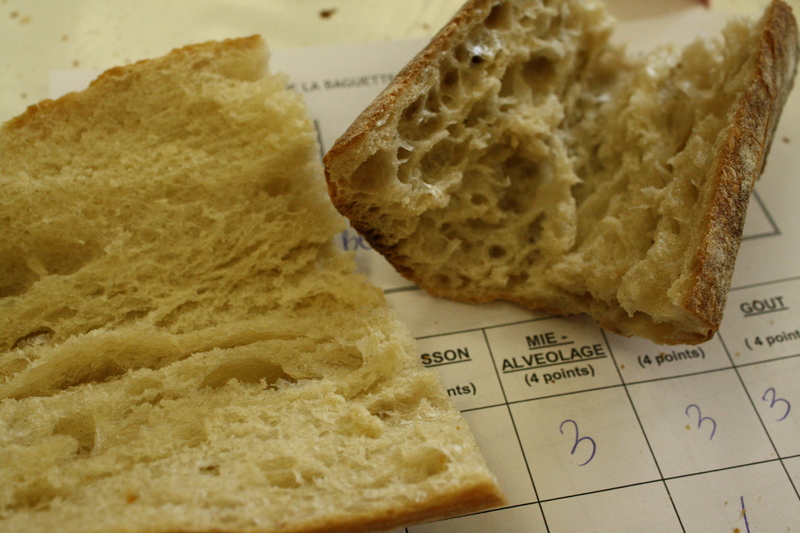 The quality of bread at specific boulangeries cannot vary that drastically in so short a time, no?